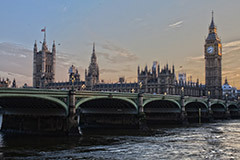 The United Kingdom, one of the most influential countries of the world, is characterized by a multicultural society, one of the best free health care services in the world, superior education opportunities, and an unparalleled finance sector. The golden residency program of the UK has the shortest processing time among similar programs for G8 countries: typically, the permit is granted within 6-8 months. The process is also characterized by straightforward criteria, ensuring a predictable outcome. Furthermore, the non-domiciled resident status offers an attractive taxation environment for high net worth individuals. Applicants and their family members are required to reside in the UK at least 50% of the time after their permit is granted. Your spouse, children under 18 and financially dependent children over 18 can be included in the residency application. All applicants must reside in the UK after getting their residence permit, and children’s residence permit will only be granted if both parents’ permit is. To qualify for the golden residency program, you must demonstrate that you have the financial means to support yourself and your dependents without taking employment (apart from self-employment or business). You also have to make the UK your main home, meaning that you cannot spend more than 180 days a year outside the country. You do not have to demonstrate business management experience or English skills at this point. You will first receive a Tier 1 visa for 40 months, and have to make the selected investment within 3 months of entry. After the end of the 40-month initial period, your residence permit will be extended for 2 years if you have continued to satisfy the requirements throughout your stay. After 5 years, you will become a permanent resident. For this status, you have to demonstrate knowledge of the English, Welsh or Scottish Gaelic language and basic familiarity with the life and culture of the UK. You will also be able to apply for UK citizenship (additional criteria apply). Note that this time can be shortened to as little as 2 years by increasing the investment amount (see below). A UK residence permit allows you visa-free travel to several European and British Commonwealth countries. If you decide to apply for a UK passport after gaining permanent residency, you will be able to travel visa-free to more than 150 countries including the EU (Schengen), Australia, Canada and the USA. To obtain temporary residency for 5 years and permanent residency after that, applicants are required to invest GBP 2 million. 75% of the investment has to be in the form of government bonds or business investment, while 25% has to be spent on purchasing assets or making a bank deposit. If you wish to receive permanent residency sooner, you can increase the investment amount. If you invest GBP 5 million, you will become a permanent resident in 3 years, and for GBP 10 million, the time to PR is only 2 years. Note that this only applies to the main applicant and not to dependents – they gain PR after 5 years under all 3 investment options. An application fee of GBP 1,561 is payable for online and mail application. If you decide to apply in person, the fees are significantly higher and depend on the number of applicants. In addition, a health surcharge has to be paid, the sum depending on the number and age of applicants. Please get in touch with us for a precise quote.